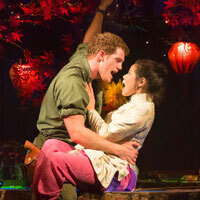 Experience the acclaimed new production of the legendary musical MISS SAIGON, from the creators of Les Miserables. This is the epic story of a young Vietnamese woman named Kim. In a bar run by a notorious character called The Engineer, Kim meets an American G.I. That encounter will change their lives forever. Featuring stunning spectacle, a sensational cast of 42, and a soaring score including Broadway hits like "Last Night of the World," "The Movie in My Mind," and "The Heat is On in Saigon," this is a theatrical event you will never forget.